Dr. D. Niarchos obtained his B.Sc. and Ph.D. in Physics-Materials Science from National Kapodestrian University of Athens, Greece in 1972 and 1980 correspondingly. He holds also MBA of R&D from Loyola University in 1985. From 1978 to 1981 he was IAEC Distinguish Post-Doctoral Researcher at Argonne National Lab and from 1981 to 1985 he was Assistant Professor at the Illinois Institute of Technology, Chicago, USA. He then moved to the Institute of Materials Science of the NCSR “D” in 1985 as Senior Researcher. 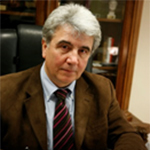 From 1994-1999 he served as the Director of Institute of Materials Science of the NCSR Demokritos and from 1996-1999 he was elected as Vice President of the NCSR “Demokritos”. From 2005-2010 he was elected as Director and President of the Board of the NCSR “Demokritos”. He is the Director of the MagLab at NCSR Demokritos at the Institute of Nanoscience and Nanotechnology and in charge of the group of permanent magnets, magnetic recording and sensors and advanced energy related materials. The MagLab is well equipped with state-of-the art infrastructure for thin film growth using sputtering and laser ablation, preparation of nanoparticles and bulk materials. He is the author and co-author of more than 420 publications with more than 6500 citations with an impact h-factor 32. He has managed more than 35 National and EU projects with a budget of approximately 15 MEURO. He has also trained 23 PhD students, more than 20 Master and numerous students towards their Diploma Thesis.He had served as advisor for the Greek Government and the EC. Magnetic materials play an important role in improving the efficiency and performance of devices in electric power generation, conditioning, conversion, transportation, and other energy-use sectors of the economy. Magnetic materials are integral part of motors, actuators and generators; they provide the mechanism to turn mechanical energy to electrical energy, and vice versa. The stronger the magnet, the more energy-efficient the device can be, so these supermagnets are utilized in computers, automobiles and other vehicles (including hybrid vehicles), consumer electronic products, medical products and systems and motors of all kinds. Globally, magnetic materials market is projected to reach $33 billion by 2020 from the current $ 22 billion. The permanent magnet markets are expected to increase from $11 billion in 2010 to $15.5 billion by 2020. Advanced amorphous and nanocrystalline soft magnetic materials are also of interest for inductors/transformers, high frequency power electronics components and power conditioning systems. Thus, optimizing soft and hard magnetic materials and to extend the temperature span in which they are applicable can imply a notable enhancement in the energy efficiency of these devices. There are also a few new applications of magnetic materials which can help us reach larger energy efficiency. One of them is magnetic refrigeration, associated to the magnetocaloric effect. Taking into account that the largest electricity consumption in the domestic market is related to refrigeration and air conditioning, the improvement of these devices via the use of magnetic technologies will translate into a large reduction in energy consumption. We will also present current worldwide efforts to eliminate or substitute critical materials e.g. rare-earths in the magnetic materials with the objective to increase their applications.